Classic wartime sitcom. Mainwaring is overjoyed when he is offered the use of a Rolls-Royce but gets a shock when it returns from its trip to be camouflaged. Browse content similar to The Captain's Car. Check below for episodes and series from the same categories and more! Don't sit in my chair when I'm not here, Wilson. Sorry, sir. I was just writing out a notice. -That's neither here nor there. Don't sit at my desk. -What am I supposed to lean on? Use your initiative and write on your knee. -Did I give you permission to sit? -I am an officer, and you're supposed to be an NCO. This was the notice I was writing. "Do not lean back in this chair." There was a phone message for you. The French General is coming. -The Colonel. It's here somewhere. "The visit is confirmed. "A Home Guard unit is to provide a guard of honour at the Town Hall." I hope they don't pick us. Don't they realise we're frontline troops? Anyway, I was never very keen on the French. -Only up to a point. -They're not much good after lunch. Wine and garlic are very debilitating. All they do is chase women. "Come with me to the Casbah." They are rather emotional, sir. They go in for sloppy kissing. They even kiss at medal ceremonies. -If you were picked as guard commander, you'd get one. -I wouldn't stand for any of that sort of thing. Captain Mainwaring, there is a lady outside who wishes an audience. When I say a lady, I don't mean she's a woman, although of course she is a woman. -She rejoices under the name of Lady Maltby. She didn't give me any confidence. Lords and Ladies seldom do. -When we were in the Sudan, Lord Kitchener never gave any of us any confidence. When her Ladyship enters, leave. She'll want to deal with an officer. Her Ladyship, the Lady Maltby. -This is indeed an honour. I'm Captain Mainwaring. This is my Sergeant. He's just going. -Arthur, how nice to see you. My goodness me! You look absolutely marvellous. It really is good to see you. She's certainly got confidence in Mr Wilson. They've met before. I seem to know your face. I've been purveying meat to your establishment since his Lordship fell out with Sainsbury's. Of course! You're Mr Jones. They'll be one book extra this week. My son is home on leave. -I've got some nice chops. -Talk it over with the cook. -Jones, that'll do, thank you. -Arthur, it is nice to see you again. -Yes, of course it is. So Nigel's coming home. -Did he really? Of course he did. Auntie Lettice told me. -And now he's in the Blues. -Is he really? My grandfather was in the Blues. -Lady Maltby hasn't come here to talk to you. Forgive us, but it's ages since Arthur and I had a chinwag. -Actually, I came here about my car. -I can't get any petrol for it. I thought somebody ought to use it towards the war effort. I'll have it back when we've won. Oh, just an ordinary sort of Rolls. -Would the Home Guard or the Wardens put it to best use? I'm so glad you think that. Mr Hodges is awfully common. Of course, I know Mr Jones, and Arthur is such a darling. I'm sure you're very nice, too. We'd look after it most carefully. My men are very reliable. They are all hand-picked. Hey! They're all lined up out here waiting, and if you don't come soon, we're all off home. Rough diamond, that one. Just the chap to have on your side in a scrap. -What would you do with a Rolls? -It would be my staff car. -But it's also shiny and Rolls-Roycey. -But wouldn't a huge, great, big Rolls-Royce look silly? -I suppose we could sit you on a cushion. -A horse went down the street, so I brought you some for your roses. I'll leave it in the back. A new recruit. We haven't licked him into shape. I'll ask Glossip to drive it round on Saturday morning. -You've been a brick, Angie. -Pop round for a drink. -Mainwaring. I shall be delighted. Thank you. -Ask Captain Mainwaring to let you off. She's awfully sweet, don't you think? -You kowtowing to her just because she's got a title. It cuts no ice with me. Tell that to your Auntie Lettice. -Where is he? You've done it! -How dare you barge in here? You put her off giving me that car. We haven't put her off at all. It's just that we know her socially. We're providing half the guard of honour for the French General. -I hope you're not providing the other half. -If you're going to be there, I shall refuse to parade. Just watch it and mind your step. If I see any light from this hall, or if you leave your bicycle without immobilising it, I'll have you. -I haven't got a bicycle. -Then you'd better immobilise your crutches! He's the most appalling fellow. He's no business to be Chief Warden. The man's a greengrocer. -Really? In a big way, I suppose? It's not what or who you know. It's how much of it you have. We'll have no bolshie talk here. Go and fall the men in. Yes, sir. All right, chaps, fall in. Three nice, tidy, little rows. Come on. I'm proud to announce that we have an addition to our battle fleet. It's a Rolls-Royce staff car. -Can I drive it, Mr Mainwaring? -Bags I first ride in it. A Rolls-Royce is very comfortable. I went to a wedding once. You gave the driver instructions through a speaking-tube. It wasn't my car. They're reliable, too, sir. Lord Kitchener had one in 1914. General French also had one. When I say General French, I don't mean he's a French General. General French was an English General. Some find that confusing. But I wasn't talking about him. I was talking about Kitchener. He was getting worried about recruiting. He thought he was going to run out of men. He was getting into his Rolls, when he noticed the dashboard was all mingy. He turned to his driver and said, "Why is my dashboard so mingy?" "Well," said the driver, "it's this foreign mahogany. We need English wood. We need yew." "That's it!" said the general. "That's the slogan. 'Your country needs YOU.' "
Not many people know this story. -He never ran out of men after that, sir. -Stand your men at ease. You've been selected to provide the guard for the French General. You see the reward for being smart. -You have also been chosen because of the person who has to make the speech. -It has to be in French. -Oh! Well...I suppose I could practise. -Your Sergeant speaks French. He's the obvious choice. -What you might call "un petit peu". I'm very much against these parades. They use up valuable training time. I've been asked by Area to make this as smart as possible. -It can hardly be smart with those Wardens. -Quite right. We should provide the whole guard. Yes, the presence of the Wardens will make it a bit of a shambles. I'll have a word with the Mayor. -You can provide the whole guard. And Uncle Arthur will make the French speech. -Nous sommes... Answer that, Frank. Morning, it's Glossip here. Lady Maltby's chauffeur. I'm on my way to get the Rolls camouflaged for Captain Mainwaring and I've run out of petrol. You stay there, and we'll come and push. Captain Mainwaring's Rolls-Royce is stuck. We've got to push it. -You can't push a great big thing like that. -You can. Mum's always saying you're muscular. -If I get petrol, could I drive it? The chauffeur wouldn't let you. -You could make him. Commandeer it. -Don't be silly. Tell him we can't do anything. -I haven't got the number. Come on. -I've left him a note. Come on. For heaven's sake. Why all the hurry? Frank, come back here for a moment. -Uncle Arthur, it's Mr Hodges' bike. There'll be petrol in that. -Frank, that would be stealing. You could commandeer it. It's only Mr Hodges'. -How will you get it from there into that? -We pour it in, don't we? -I saw him go off with Pike. They've left a note. "Rolls broken down by Town Hall. Gone to help." I don't see what help he can give them. It should be at the paint shop. -Jones, take your van and a length of rope and tow them there. -I'll come too. There might be a story. -Have you no regard for the truth? Don't insult the Press. Jones's deliveries are vital supplies. That's the last drop. Can I drive it? -Can I ride in the back? -Yes, I'm sure Glossip will drive us to the paint shop. -The mace is dirty. And Roger can't clean it cos he's laid up. -What do you expect me to do? This should have been done ages ago. Come on, lads, get the rope out. Tie it on the front, and we'll tow it round the paint shop. -How much is Mainwaring paying for this camouflage job? I have a spray gun at my workshop. I use it on the hearse. It's only brown and green paint. I don't think Mr Mainwaring would like that. We're saving money, man! Platoon funds. Jones the butcher, it's ready to go. Right, you steer the other one. No sign of them yet, sir. I can't think what's happened to them. I wanted to give them a parade briefing. I'm getting rather chilled, sir. One loses heat standing around. Jump up and down a bit. -Your hooligans have pinched my petrol. Oh, yes, they have. They poured it from my bike as if it was a teapot. And they left it on its side. -What's this, then? "Petrol requisitioned. F Pike." You're not getting me off that parade. I'm going to appeal to the Home Secretary. -We've got it, Mr Mainwaring! -I sat in the back and waved. -What are you going to do about this? -I'm going to inspect my new staff car. -She should have given it to me. Isn't it magnificent? Look at that craftsmanship. -No French car can match that. -It's an awfully good staff car. I bet there isn't another one like this in the British Isles. Look at that. He's got another one. Typical Mainwaring - one on and one in the wash.
-Where did you get this car? -Where did that one come from? but the Town Clerk wants you. The Mayor has lost his Rolls-Royce. 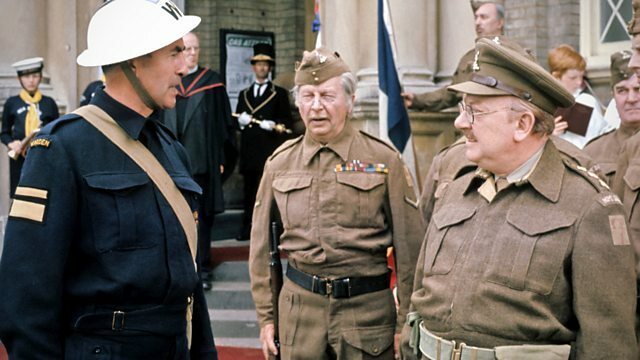 Do you think the Mayor will be cross with Mr Mainwaring for putting paint all over his Rolls-Royce? It's like this, Mr Mainwaring, I think it's been stolen. I don't know what to do about it. -Have you informed the police? -You see, I was the one who left the window open. I'm responsible for not immobilising it. If you don't immobilise them, you can get three months. I thought, seeing how you have a lot of men, you might send them out to look for it. -Yes, I might be able to help. -Thanks. Should I inform anyone else? No! Leave this in my hands. You'll have to look sharp. We need the car for the French General. -I didn't touch the car. I could have it in every paper in the country. Jock, can you spray it black again? -Park it outside the Town Hall. -Nobody will be any the wiser. -They will. I'm going to split. Sneak! Call me what you like. Unless we go on parade, I'm going to tell the Mayor. He's got us by the fuzzy-wuzzies. you can come on the parade. General Kitchener used that saying, because them fuzzy-wuzzies have got short, curly hair. I'm only trying to make the war a bit more cheerful. I'm sorry about this, but I can't get the flashbulbs. -Are you going to say all that? -Quite a lot of it is scratched out. -I changed my mind a lot. -Keep it short, or it'll be boring. -I have to talk until the car comes. -I'll take one of you and the General, like you said. By Jove. What a magnificent job. Here! When you bawl and shout instructions of "attention" and "present arms", we won't listen. -You'll turn the parade into a shambles. -All right, I'll shout the orders for your lads. -Do you want the bugler to play before or during the salute? -During, and then we'll sing the "Marseillaise". Just give me the nod, your reverence. Did everything go all right? Fine, except I couldn't get any quick-drying paint. -That's Come To The Cookhouse Door. -He doesn't know The Last Post. -Look at him, the man's blubbing. -It's very sad, Mr Mainwaring. -There wasn't time to learn the rest. They're only little boys, you know. You've got to hand it to him. Mum says he can do anything once he's got the urge. ..et victorieux dans votre France bien aimee. je ne puis pas parler. Mon coeur deborde. Here! Don't I get a kiss? Captain Mainwaring is offered the use of a Rolls-Royce. On the way to be camouflaged, it gets mixed up with the mayor's official car.